The Top Five ads below are all linked to live creative and show close-ups on scores for the various KPIs. There's a lot to learn about advertising effectiveness by studying these successful ads. For great examples of successful ads in other media types, see our resources page, "Integrated Marketing in All Media." The ABX Index is an overall measure of ad effectiveness that has been shown to correlate to brand performance. It is comprised of Awareness, Messaging, Reputation and Call-to-Action. An ABX Index of 100 is average for all benchmarked ads, whereas an ABX Index of 109 is the average for TV spots. The waterfall chart below, shows the ABX advertising effectiveness Index for each of 61 ads. Only a few exceed an Index of 120, which is the threshold for excellence. Keep in mind that the "popular" press ad ratings for Super Bowl are really only "Likability" ratings. While Likability can contribute to the success of an ad, it is not predictive of success. 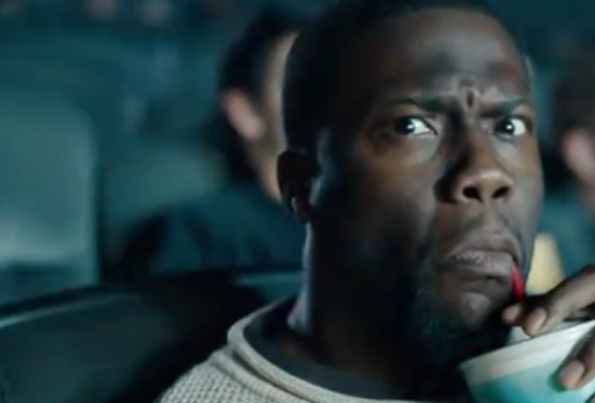 For example, among these Super Bowl ads, Likability has a very poor correlation with Purchase Intent. For today, let’s look at creative effectiveness results of the Top Five Super Bowl ads and why they worked. Tomorrow, we’ll look at the bottom five to see what went wrong. Keying off our nation’s obsession with dogs, Doritos struck gold with a humorous 30-second spot showing the length dogs will go to get a package of Doritos. This ad works with a high Likability score (+113% - more than double the norm but not shown) AND a huge Purchase Intent score (+111% - which is part of Action). 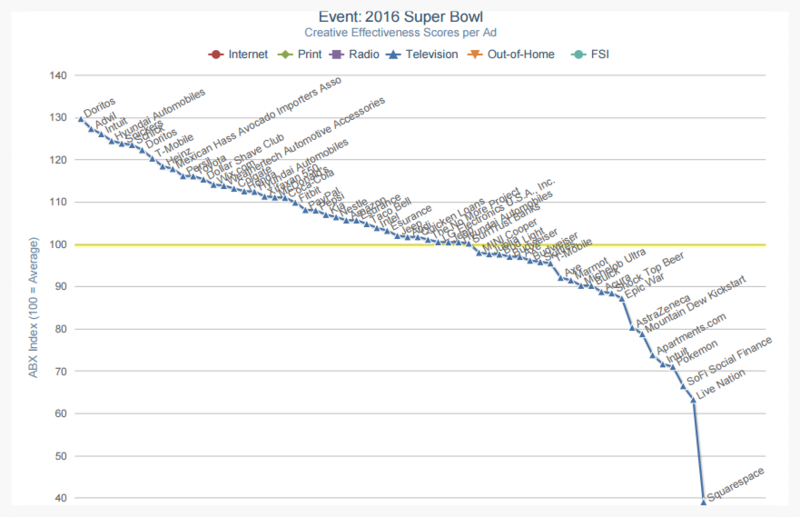 It ranked #4 in the USA Today Ad Meter Super Bowl 2016 for overall Likability. This is a great, upbeat, amazing feats-type of ad with huge Message clarity (+36% above norm), huge Purchase Intent (+110%, part of Action) and Reputation (+58%). This ad is likely long-wearing as the athletic prowess displayed by the actors never grows old. 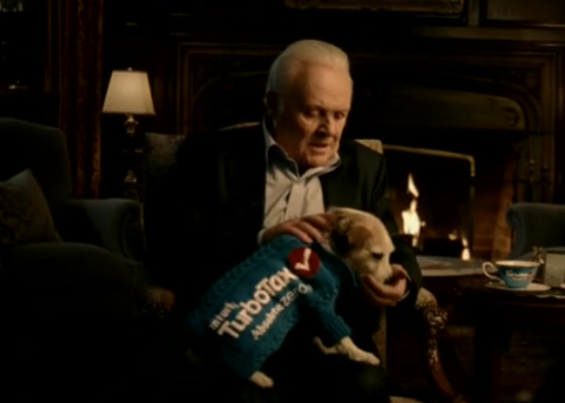 At an ABX Index of 126, TurboTax distinguishes itself with an excellent ad that you want to see more than once. 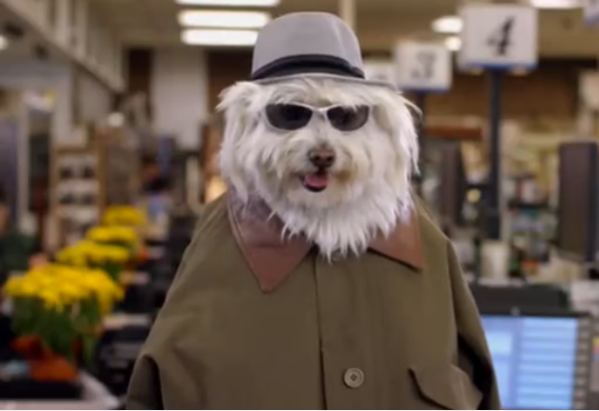 Another doggie coup, this ad scores big on Message (+32%), Reputation (+58%) and Recommendation (+48%), but slightly below average on Purchase. Perhaps that’s because the whole ad stresses that TurboTax is free? This ad was rated #1 by the USA Today Ad Meter for overall likeability, and ABX benchmarking also gave it a big score at +92%. The ABX Action score is decent, so the ad delivers in portions of the purchase funnel, but underperforms for Purchase Intent (-61%). This ad is goofy, but it works like crazy. Willem Dafoe is dressed as Marilyn Monroe filming a scene from The Seven Year Itch, and is upset that he has to stand over a subway grate. The “Snickers moment” turns him back into Marilyn. Whatever your opinion, it generated a big +144% in Purchase Intent, +45% in Reputation and +97% in Talk. Successful indeed. Some great advertising above, and we'll have even more fun dissecting the underperforming ads tomorrow!